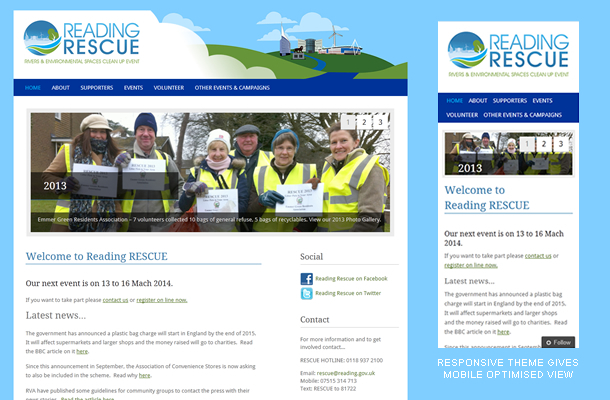 Details: The team at Reading RESCUE (who bring the public, community and the business sectors together to plan and deliver outdoor clean up events in Reading) wanted a revamp of their old WordPress website and contacted me as I was involved in the previous project. On a tight budget I selected a new WordPress Theme to their WordPress.com hosted site, and applied some Custom CSS updates to style the site up with their existing brand. I then reviewed and reorganised the previous content and adding a Twitter feed and Image slider on the homepage. The result was a modern looking site with social media integration and that was mobile optimised via responsive design.